Each day, Monday to Saturday, some of the very best writers from across the Anglican tradition offer insightful, informed and inspiring reflections on one of the day's readings for Morning Prayer. Their reflections will appeal to anyone who values both the companionship of daily Bible notes and the structure of the Lectionary. 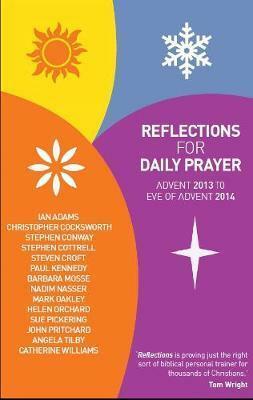 For every day (excluding Sundays) of the 2013/14 church year, there are full references and a quotation from the day's set of Scripture readings, a concise but challenging commentary on the readings and a collect. Contributors to the 2013-2014 edition: Ian Adams, Christopher Cocksworth, Stephen Conway, Stephen Cottrell, Steven Croft, Paul Kennedy, Barbara Mosse, Nadim Nasser, Mark Oakley, Helen Orchard, Sue Pickering, John Pritchard, Angela Tilby, and Catherine Williams. IAN ADAMS is an Anglican priest, an Associate Minister with Fresh Expressions, a missioner with the Church Mission Society and founder of mayBe, a new monastic community in Oxford. A popular Greenbelt speaker, he is the creator of Morning Bell, a daily call to prayer sent by e-mail, text and twitter. He lives in South Devon. Christopher Cocksworth is the Bishop of Coventry and former principal of Ridley Hall, Cambridge. He served on the Liturgical Commission of the Church of England from 1999 to 2006. SUE PICKERING is an Anglican priest in New Zealand. She is a popular conductor of retreats and quiet days.